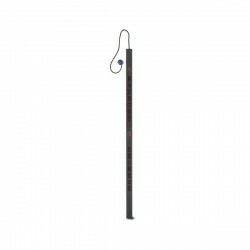 Vendor-neutral mounting for guaranteed compatibility with all EIA-310 compliant 19" equipment. APC's "Fits Like a Glove" money back guarantee provides peace of mind that all of your EIA-310-D compliant rack-mount equipment will physically fit in a NetShelter SX enclosure. Superior door ventilation exceeds airflow requirements for major servers. Scalable cooling options for high-density applications. the opposite side, doors can be detached and reversed. SX enclosures can be easily expanded upon to create complete rows of enclosures. In addition, the SX can be tied into the existing VX build-outs via the appropriate baying hardware. Adequate ventilation is required for proper operation of today's servers. NetShelter SX Enclosures include fully perforated front and rear doors to provide ample ventilation for servers and networking equipment. 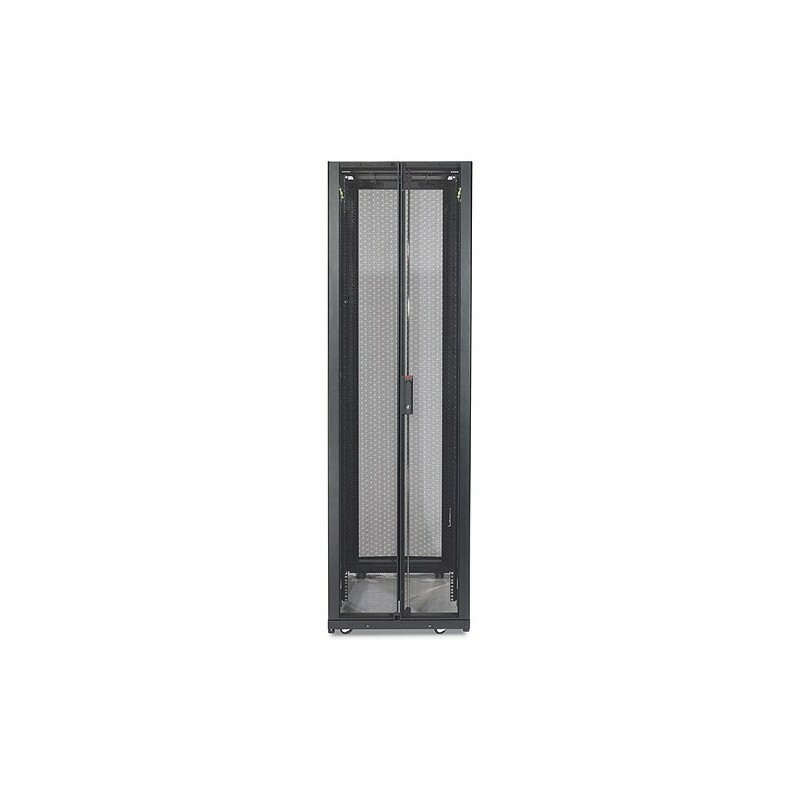 The perforation pattern provides 919 square inches of open area on the front door, exceeding requirements set forth by major server manufacturers. Although this ventilation pattern provides adequate cooling for most configurations, air-moving accessories such as APC's Air Distribution Unit are also available to support higher heat density applications. Integrated rear cable management channels allow customers to easily route, manage, and access large numbers of data cables even while an enclosure is loaded with rack-mount equipment and bayed within a row. Rear power distribution channels provide easy access to multiple receptacles occupying zero U in recessed channels . 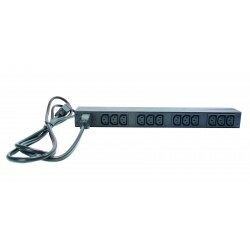 The rear power distribution channels allow APC basic, metered, and switched vertical rack PDU's to be installed easily in the rear without interfering with equipment or taking up valuable U space. This provides increased accessibility to receptacles and allows customers to support more power cords within the enclosure. Up to 42 5-15R receptacles can be installed in just one rear cabling channel. Generous cable access holes are provided in the roof and base of the NetShelter SX to enable power and data cables to be routed into the rack either from overhead or from underneath a raised floor. The NetShelter SX enclosure offers eight cable access holes of various sizes on the roof. The eight are broken out as follows: five 60mm x 175mm, two 79mm x 167mm, and one 79mm x 245mm. In addition, for maximum cable routing capacity, the roof can be removed entirely even if cables are already installed. The base of the rack is an open design, maximizing the potential access space for under-floor cable routing. Rapid installation of rack mounted equipment. Enclosures deeper than those traditionally used are required to properly install the latest servers, distribute power, and manage cabling in today's data centers. The struggle facing data center managers is determining how deep to go without sacrificing valuable floor space. In a hot aisle/cold aisle layout, the NetShelter SX Enclosures provide the maximum enclosure depth (42 inches (107 cm)) without sacrificing floor space. 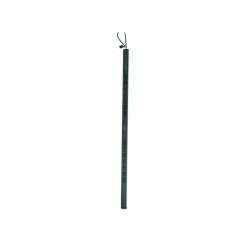 This allows for 36 inches (91 cm) of clearance in the hot aisle and 48 inches (122 cm) in the cold aisle. In a hot aisle/cold aisle layout, selecting enclosures less than 42 inches (107 cm) deep will not allow more enclosures to be installed in a data center, but only increase the clearance in the hot aisle. NetShelter SX Enclosures are designed to align exactly on standard 24 inch and 600 mm wide floor tiles when bayed together. APC has made installation fast and easy by designing the SX enclosure such that it rolls through standard 2 meter doorways. This feature does not apply to the 48U versions of the SX. The NetShelter SX Enclosures ship fully assembled reducing the time required to install equipment. Increased level of security to prevent unauthorized entry. Front doors, rear doors, and side panels are lockable and only accessible with a key provided with NetShelter Enclosures. Integrated grounding provides safety protection against electric shock and improves the reduction of EMI emissions. The side panels and roof have integral grounding features which eliminates the need for ground straps or wires. The front and rear doors of the SX enclosures are supplied with factory-fitted ground wires. NetShelter SX Enclosures are UBC (Uniform Building Code) Zone 4 compliant if used in conjunction with APC's Bolt-Down Kit (part # AR7701). During installation and while conducting routine maintenance of installed equipment, it is often advantageous to remove the enclosure doors. Quick release hinge pins allow for fast, easy access. During installation and while conducting routine maintenance of installed equipment, it is often advantageous to remove the side panels. Quick release side panels allow for quick, easy access.